Not since 1994, when the Summer CES stopped camping out yearly along Michigan Avenue and Lake Shore Drive, has the Windy City played annual host to a large high-end audio show. 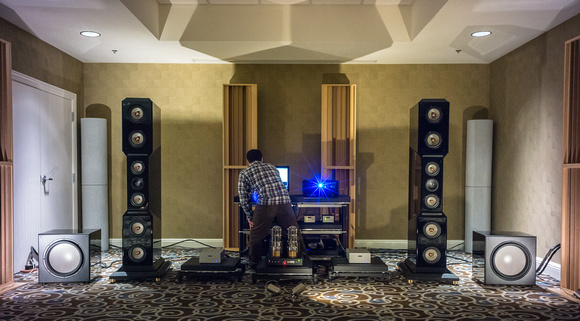 That situation will certainly change after this past weekend’s AXPONA Chicago 2013. Usually in a show report I take you on the same journey that I make, going room to room as I listen to expensive loudspeakers. But in this blog, I’m only going to touch on the highlights of the show. It’s not that I didn’t travel from room to room with my briefcase full of blues—it’s just that we (Robert and I) weren’t sure whether this inaugural event would justify CES-style in-depth coverage. Next year, we’ll know better. As is the case with most audio shows, the large meeting rooms on the ground floor and the mezzanine of the Doubletree housed many of the biggest and most elaborate systems, like the giant Focal Grand Utopia EMs (which, driven by Pass Labs electronics, showed better here than at any other trade show I’ve attended), Sonus faber Amati Anniversarios (ditto, driven by ARC), and Venture Grand Ultimate Mk IIs. Rather surprisingly, all three powerhouses sounded quite marvelous and majestic (a first, in my show experience). Of course, big speakers with big woofers or multiple subs (the Sonus fabers were paired with four of ’em) will always have issues in the bass, even in (or maybe that should be especially in) huge untreated conference rooms. Here, for whatever reason, those issues were relatively minor. A little overall darkness and bottom-end thickness aside, each of the Big Boys had the kind of granitic solidity from the bass through the power range and into the mids, on, say, The Talking Heads’ Stop Making Sense or the great RTI repressing (not the hideous Speakers Corner one) of Janis Joplin’s Kozmic Blues [Columbia}, that makes both singer and band sound as rich, exciting, and powerful as they did in life (and I’ve heard both of them in concert). There was even a notable debut in the ultra-high-end ranks—Albert von Schweikert’s $140k seven-driver, ribbon/cone hybrid VR100 XS, paired with two of Albert’s Shockwave subwoofers and bi-amped by Kronzilla tubes on top and Channel Islands Class D on the subs (see photo above). Though the subs were turned up a bit much on Day One, by Day Two the speaker was sounding quite robust, full-bodied, and beautiful. Best of show contenders for sure. The speakers in the converted hotel rooms on the seventh, eighth, and ninth floor fared uniformly well sonically. 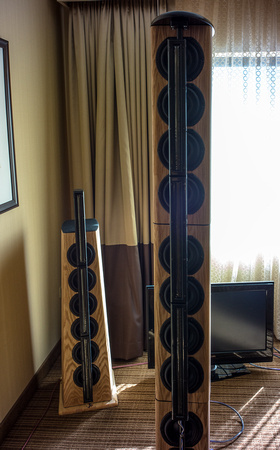 Even speakers that had been slightly disappointing at previous shows—like the Wisdom I75 planar-magnetics, the Harbeth 30.1s cones-in-a-box, the Verity Amadis W/ps driven by Convergent Audio Technology electronics, the concentric-driver KEF Blade, or the true ribbon Scaena iso-linear line sources (though the Scaenas could’ve used more distance between their subwoofers and the main towers)—seemed to get their mojo back in Chicago, while the usual suspects—such as the mbl 101s driven (of course) by MBL electronics or the marvelous TAD CR1s driven by Parasound electronics—were their superb selves. (More on the mbls in a moment). Even some of the oddities—such as the strange and very promising Newform Research LineSource Reference, which suspends a long cylindrical ribbon directly in front of about twelve dynamic mid/woofs—were excellent sounding (see photo above).